"Cosmic egg" redirects here. For the Wolfmother album, see Cosmic Egg. The world egg, cosmic egg or mundane egg is a mythological motif found in the cosmogonies of many cultures that descend from the proto-Indo-European culture  and other cultures and civilizations . Typically, the world egg is a beginning of some sort, and the universe or some primordial being comes into existence by "hatching" from the egg, sometimes lain on the primordial waters of the Earth. This is one of many material universes, Brahmandas, which expand from Mahavishnu when He breathes. The earliest idea of "egg-shaped cosmos" comes from some of the Sanskrit scriptures. The Sanskrit term for it is Brahmanda (ब्रह्माण्ड) which is derived from two words - 'Brahma' (ब्रह्मा) the creator god in Hinduism and 'anda' (अण्ड) meaning 'egg'. Certain Puranas such as the Brahmanda Purana speak of this in detail. The Rig Veda (RV 10.121) uses a similar name for the source of the universe: Hiranyagarbha (हिरण्यगर्भ) which literally means "golden fetus" or "golden womb". The Upanishads elaborate that the Hiranyagarbha floated around in emptiness for a while, and then broke into two halves which formed Dyaus (Heaven) and Prithvi (Earth). The Rig Veda has a similar coded description of the division of the universe in its early stages. According to Zoroastrian cosmology, the period of (material) creation, also to last 3,000 years, began after the treaty, when Ohrmazd recited the Ahunwar (Av. Ahuna Vairiia) prayer, reveal­ing to Ahriman his ultimate defeat and causing him to fall back into the darkness in a stupor, which lasted for the entire period of the creation. During this time Ohrmazd fashioned his creations in material (gētīg) form, by celebrating a “spiritual yasna”. He placed each creation under the protection of one of the seven Amahraspands (Av. Aməša Spənta). First he created the sky (protected by Šahrewar, Av. Xšaθra Vairiia), which enclosed the world like the shell of an egg. The second creation was water (protected by Hordād, Av. Haurvatāt), which filled the lower half of the “egg.” The third creation, earth (protected by Spandārmad, Av. Spənta Ārmaiti), shaped like a flat disk, floated on the primeval waters. On it stood the fourth, fifth, and sixth creations, respectively the single plant or tree (protected by Amurdād; Av. Amərətāt), the uniquely created bull (protected by Wahman, Av. Vohu Manah), and the first man, Gayōmard (Av. Gaiiō.marətan, protected by Ohrmazd himself). The seventh creation, fire (protected by Ardwahišt; Av. Aṧa Vahišta), was said to have permeated all other creations. During the 3,000 years of the period of material creation these creations were motionless, and the sun stood still in the middle of the sky. The Orphic Egg in the ancient Greek Orphic tradition is the cosmic egg from which hatched the primordial hermaphroditic deity Phanes/Protogonus (variously equated also with Zeus, Pan, Metis, Eros, Erikepaios and Bromius) who in turn created the other gods. 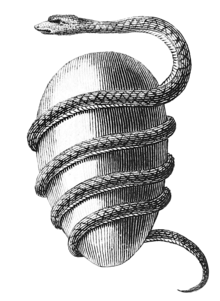 The egg is often depicted with a serpent wound around it. Many threads of earlier myths are apparent in the new tradition. Phanes was believed to have been hatched from the World-Egg of Chronos (Time) and Ananke (Necessity) or Nyx (Night). His older wife Nyx called him Protogenus. As she created nighttime, he created daytime. He also created the method of creation by mingling. He was made the ruler of the deities and passed the sceptre to Nyx. This new Orphic tradition states that Nyx later gave the sceptre to her son Uranos before it passed to Cronus and then to Zeus, who retained it. The Ancient Egyptians abided by a multiplicity of truths when it came to creation myths. For instance, the Hermopolitan, Heliopolitan, and Memphite theologies, were equally validated. Under the Hermopolitan theology, there is the Ogdoad, which represents the conditions before the gods were created (Van Dijk, 1995). An aspect within the Ogdoad is the Cosmic Egg, from which all things are born. Life comes from the Cosmic Egg; the sun god Ra was born from the primordial egg in a stage known as the first occasion (Dunand, 2004). A philosophical creation story traced to "the cosmogony of Taautus, whom Philo of Byblos explicitly identified with the Egyptian Thoth—"the first who thought of the invention of letters, and began the writing of records"— which begins with Erebus and Wind, between which Eros 'Desire' came to be. From this was produced Môt which seems to be the Phoenician/Ge'ez/Hebrew/Arabic/Ancient Egyptian word for 'Death' but which the account says may mean 'mud'. In a mixed confusion, the germs of life appear, and intelligent animals called Zophasemin (explained probably correctly as 'observers of heaven') formed together as an egg, perhaps. The account is not clear. Then Môt burst forth into light and the heavens were created and the various elements found their stations. In the myth of Pangu, developed by Taoist monks hundreds of years after Lao Zi, the universe began as an egg. A primeval hermaphroditic giant named Pangu, born inside the egg, broke it into two halves: the upper half became the sky, while the lower half became the earth. As the god grew taller, the sky and the earth grew thicker and were separated further. Finally Pangu died and his body parts became different parts of the earth. In the book Futhark by Edred Thorsson, the cosmic egg is compared to the rune Hagalaz which is symbolic of the fertile void from whence everything is spawned. It is symbolic of the chasm Ginnungagap or the void in that the hermaphroditic giant Ymir and the cow Auðumbla dwelt as primeval beings. Hagalaz, as well as representing elemental disruption or chaos, is the potential for the birth of good or evil depending on what sorts of being or entity fertilizes the egg. In magic rituals, users of seidr or galdr will take an egg and "fertilize" it with their desired outcome, whether it be good or evil, and then crack the egg to release what is built up inside. Clouds and cloudlets in the sky. In many original folk poems, the duck - or sometimes an eagle - laid its eggs on the knee of Väinämöinen. In Cook Islands mythology, deep within Avaiki (the Underworld), a place described as resembling a vast hollow coconut shell, there dwelt in the deepest depths, the primordial mother goddess, Varima-te-takere. Her domain was described as being so narrow, that her knees touched her chin. It was from this place that she created the first man, Avatea, a god of light, a hybrid being half man and half fish. He was sent to the Upperworld to shine light in the land of men, and his eyes were believed to be the sun and the moon. In the temple of Daibod, Japan, it is represented as a nest egg floating in an expanse of water. On the island of Cyprus, the egg is represented as a gigantic egg-shaped vase. The concept was resurrected by modern science in the 1930s and explored by theoreticians during the following two decades. The idea comes from a perceived need to reconcile Edwin Hubble's observation of an expanding universe (which was also predicted from Einstein's equations of general relativity by Alexander Friedmann) with the notion that the universe must be eternally old. Current cosmological models maintain that 13.8 billion years ago, the entire mass of the universe was compressed into a gravitational singularity, the so-called cosmic egg, from which it expanded to its current state (following the Big Bang). Georges Lemaître proposed in 1927 that the cosmos originated from what he called the primeval atom. ^ Leeming, David Adams (2010). Creation Myths of the World: An Encyclopedia, Book 1. ABC-CLIO. p. 144. ^ Anna‐Britta Hellborn, "The creation egg", Ethnos: Journal of Anthropology, 1, 1963, pp. 63-105. ^ "Brewer, E. Cobham. Dictionary of Phrase & Fable. Mundane Egg (The)". Bartleby.com. Retrieved 2011-02-01. ^ "COSMOGONY AND COSMOLOGY i. In Zoroastrianism/Mazdaism". Encyclopædia Iranica. ^ William Wyatt Gill (1876). Myths and Songs from the South Pacific. London: Henry S. King & Co.
^ "Amma and the Egg that Contains the Universe". Oxford Reference. Retrieved 30 July 2018. ^ a b Graves, Robert (1990) . The Greek Myths. 1. Penguin Books. ISBN 978-0-14-001026-8. ^ "Books: The Goddess & the Poet". TIME. July 18, 1955. Retrieved 5 December 2010. Dunand, Françoise, and Christiane Zivie-Coche. 2004. Gods and Men in Egypt: 3000 BCE to 395 CE. Ithaca: Cornell University Press. This page was last edited on 14 March 2019, at 22:52 (UTC).